Along with a visit to the Atlanta Contemporary Jewelry Show, I had the opportunity to duck into some local galleries. Topaz Gallery specializes in jewelry, representing over 100 artists from the area and around the country. Several of the artists exhibiting at the jewelry show also had work in the gallery. The owner, Peter Embarrato, is very engaging and totally knowledgeable about every piece of work in the shop. 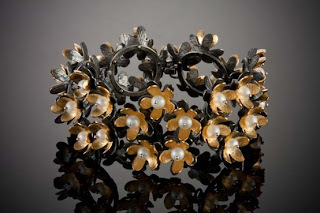 Molly Dingledine exhibited her delicate floral jewelry at both the show and the gallery. Her typical work is marked by repetition of petals and pearls. Ben Dyer was another artist represented by both locations. 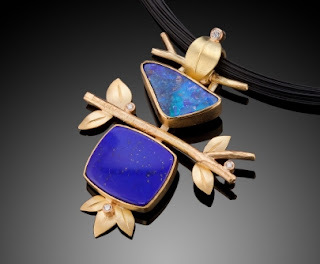 I'm quite taken with his work that combines gold leaves with gorgeous stones. 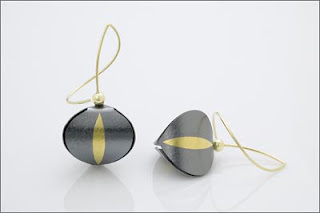 Janice Kerman is an artist whose earrings keep appearing in my Pinterest boards. Her tag line is "it's the balance, and not symmetry" which totally explains my attraction to her mismatched earrings. Conni Mainne is an artist from Mendocino that I was unfamiliar with prior to seeing her work at Topaz. Peter brought her work to my attention as someone working with Platinaire, a new alloy combining silver with platinum, created as a lower cost alternative to white gold that resists tarnishing and is harder than sterling. We chatted about comparisons with the Argentium silver that I've been working with lately. 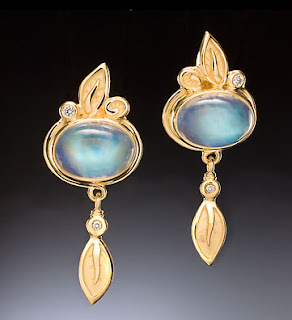 Conni had some beautiful cast jewelry with leaf motifs, one of my favorite, often set with her trademark blue moonstones. 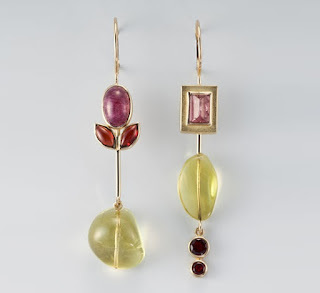 Jayne Redman jewelry has long been included in my inspiration files. Her combinations of gold and silver remind me to give that a higher priority in my experimentation schedule. Recently she has been oxidizing the silver heavily black, which makes it contrast more, a look which I really like. It was great to get an impression of the wide range from one of a kind to production of each artist by visiting both venues. Thanks for the vicarious trip to Topaz Gallery. I was not familiar with Janis Kerman's work and her asymmetry is inspiring. I always love to see Jayne Redman's work. If you get a chance to take a workshop from her don't hesitate! She's a great teacher! Glad you enjoyed the tour, Barb! There's always somebody new to find whose work is inspirational. I didn't realize Jayne Redman taught workshops, but I'll keep an eye out.